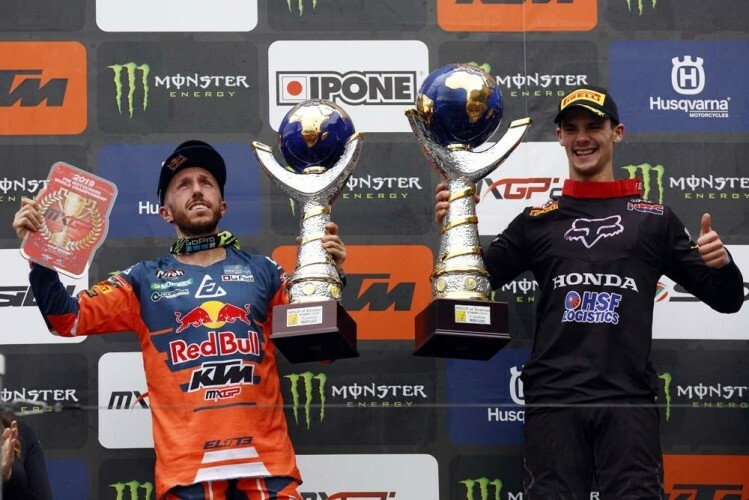 Posted on 8, April 2019 by EuropaWire PR Editors | This entry was posted in Automotive, Entertainment, Italy, News, Sports and tagged 2019 FIM Motocross World Championship, Alessandro Lupino, Antonio Cairoli, Grand Prix of Lombardia, Grand Prix of Trentino, Henri Jacobi, Jorge Prado, Mantova, MONTICELLI Ivo, MX2, MXGP, PAULIN Gautier, Pietramurata, Pirelli, riders, Thomas Kjer Olsen, Tim Gajser, Tom Vialle, TONUS Arnaud, tyres. Bookmark the permalink. PIETRAMURATA, Italy, 8-Apr-2019 — /EuropaWire/ — Pirelli riders emerged winners again at ‘Il Ciclamino’ circuit in Pietramurata, Italy, which hosted the Grand Prix of Trentino for the fourth round of the 2019 FIM Motocross World Championship thanks to the Pirelli SCORPION™ MX32™ Mid Soft front and rear tyres. On the rough terrain and rain-hit soil, which has become even worse through out the race, Pirelli riders counted on the excellent performance of the SCORPION™ MX32™ Mid Soft front and rear tyres and they helped the Italian brand to claim overall victory in both classes. In the MXGP class a great battle took place between Tim Gajser and Antonio Cairoli. It was first, after two exciting motos, Gajser who emerged as the winner with a double success. Cairoli, who claimed the fastest lap in both races, tried to stop the Slovenian rider, but had to settle for second place overall. The two riders gave such an impressive pace that none of their opponents managed to get even near the dispute. Alessandro Lupino, who finished seventh at his home race, was a good performer too. After the race, Jorge Prado continues to dominate MX2. The champion made two holeshots, led every lap and registered the quickest lap-time as well. Tom Vialle climbed the podium for the second time in four races. In his debut season in the world championship Tom Vialle continues to amaze with excellent performance and results. Furthermore, Thomas Kjer Olsen was fifth in Pietramurata, ahead of Henri Jacobi, and remains in the lead in the championship with a twenty point advantage over Prado. The riders will again return to Italy in just five weeks to compete in the Grand Prix of Lombardi at the ‘Tazio Nuvolari’ circuit in Mantova, Italy.